Wow... what a work of art and absolutely beautiful. The dimension on the die cuts look fabulous and what a wonderfully designed card. I have never tried this technique before but it's now on my to do list x. 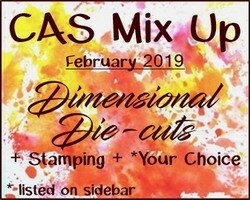 Thank you for playing along at The CAS Mix Up Challenge with your stunning card x. Your bright, shaped tulips are beautiful against the watery background, Birgit! Another masterpiece! Thanks so much for sharing with us at CAS Mix Up! Incredible dimension, the die cut apertures to the stamped grass garden all topped with those beautiful tulips. Bravo!